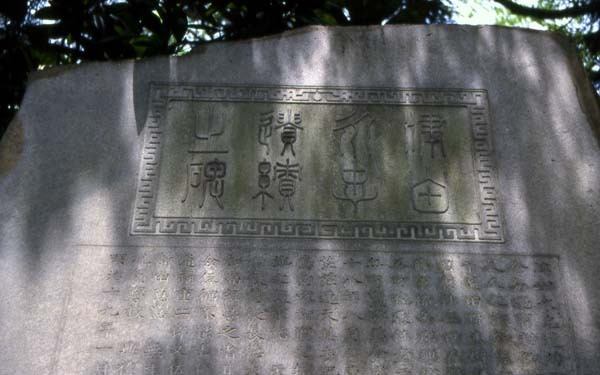 At the end of the inscription, “明治十九年一月　従三位勲三等候爵池田章政撰文、正五位日下部東作書、中備　藤田市太郎刻字” is inscribed in classical Chinese. Unfortunately, people who have never studied classical Chinese can’t understand what is inscribed on it no matter how seriously they look at it. 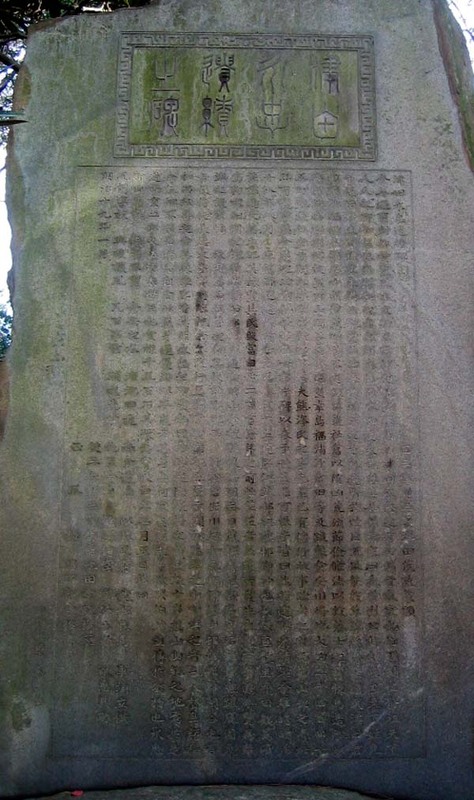 On the information board next to the monument you can find a transcription of the classical Chinese into Japanese. This transcription is the work of Hiroshi Sano, the former secretary of the Nagatada Tsuda study group (Tsuda Nagatada Kenshokai). This association meets once a month and study Nagatada Tsuda’s life and achievements, they also give lectures on these topics. As the transcription shows, it seems that the visit of the Meiji Emperor (Mutsuhito) to Okayama in August of Meiji 18 (1885) lead to the construction of the monument. The theory that puts the Korakuen in Okayama, the Kenrokuen in Kanazawa and the Kairakuen in Mito together to create “the three famous gardens in Japan” seems to have been created by a reporter accompanying the Meiji Emperor. Furthermore Michio Kibata, who made every effort to construct the monument, was probably a teacher of Hyakken Uchida (a famous writer from Okayama) and should have been mentioned in his essay. In addition, a draft of the inscription seems to have been written by Nishi Bisan, who contributed to the restoration of the Shizutani School. Nishi went to Shin (China) twice to study. Therefore it is likely that he was the author as the inscription was written in an elegant and eloquent style. The title was written by Shigemasa Ikeda, who was the 9th son of the chief of the Mito Clan, Nariaki Tokugawa, who was known as a good lord. He was also a brother of Nobuyoshi Tokugawa, who was the last general of the Tokugawas. 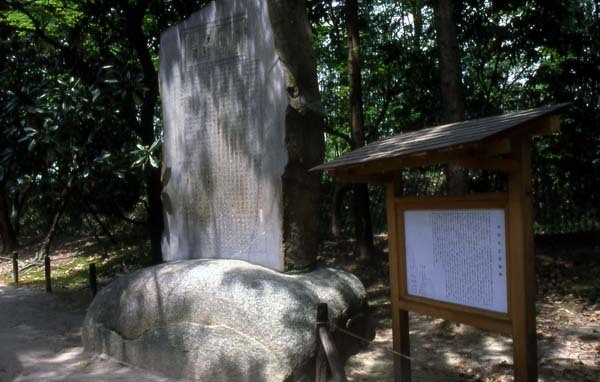 Thus, the monument of Nagatada Tsuda was constructed by a group of first-class people. When the Emperor Mutsuhito visited the monument again at the end of the Meiji period, he himself bestowed Nagatada posthumously with an rank in the Japanese nobility, he made him a 4th grade lord. This ceremony took place in the Korakuen. We can imagine that walking around in Okayama 20 years earlier had made a deep impression on him. The translation of the classical Chinese to Japanese slightly varies depending on the translator. Here is a translation that is supposed to be the closest of the three types, itself translated into English. Unfortunately our applications to list Nagatada’s accomplishments as World Heritage have thus far been rejected. It is, however, likely that the more we discover about Nagatada’s work and the more we investigate and evaluate it, the more their significance increases. Local people can properly recognize the value of his accomplishments.They can also help to sustain and manage them to make sure their value only goes up. In any case, we would like to create more activities around his accomplishments. Finally, I would like to end this article with a quote from "Kaidou wo Iku" by Ryotaro Shiba. "Without great care and regard for nature and human science, tourism itself can become a source of pollution and bring about environmental destruction. Unless we come with the right attitudes, tourism can bring harm to the public." "Japanese Civil Law values private property, but allows us to destroy the environment as we like. However, the nature of the environment is a matter of great concern to the public. This goes beyond the law. Unless we at least consider this, tourism can cause a lot of damage."